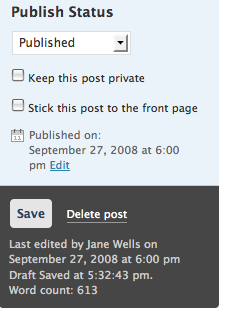 One of the new features in WordPress 2.7 (currently in an almost-beta development state) is a feature we’ve been referring to as the Favorites Menu. The idea was that instead of having just a write new post/write new page button on the Dashboard, there should be shortcuts for the screens you use the most accessible at any time so you have one-click access to those screens. The plan was to allow users to decide for themselves what would go into this menu via a configuration interface, but we weren’t able to make that happen in time for this release, so for 2.7 this will be more of a shortcuts menu than a favorites menu. That means we’re going to choose the 3-4 most commonly used screens and include those shortcuts in the dropdown menu. That’s where you come in. For WordPress.com, we can see which screens get the most traffic, but for self-hosted sites running software from WordPress.org we’d just be guessing. Also, in some cases, even though a screen is accessed frequently, it’s only one click away in the main navigation anyway, so might not be needed in the shortcuts menu. With that in mind, the poll below lists some of the main screens in the WordPress admin interface. Please select the ones you would most like to have in the shortcuts menu. You can choose as many as you like, but please limit yourself to three or four or your vote will be diluted. If there is a screen we didn’t include on this list, enter the screens you want to suggest in the Other box. Note the poll choices use the navigation language of 2.5/2.6 so that people who haven’t downloaded 2.7 won’t be thrown by the new labels.